Next week 3 new types of Rubik's Cube will be officially presented at the 59th Spielwarenmesse International Toy Fair Nurberg (from 7 to 12 February 2008). Manufactured under the V-CUBE™ technology, invented and patented worldwide by the Greek engineer Panagiotis Verdes, this technology made possible the construction of cubes, of an unlimited number of layers providing safe and smooth rotation. At Verdes Innovations you can learn more about their future projects (including one cube of up to eleven layers!) 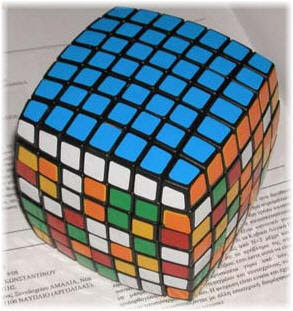 and you can also find in YouTube some videos of Speedcubing World Champion Mr. Frank Morris solving the 6x6x6 or the 7x7x7 versions.